A mysterious metallic virus has devastated the immense City-Shaft, and John Difool is going to have to once again transform himself into humanity’s improbable savior! 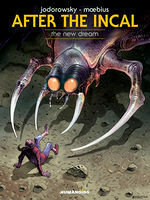 The last cycle of the adventures of John Difool, After The Incal was not yet completed when Moebius stopped working on the series. When Jodorowsky discovered the talent of Jose Ladrönn, he rewrote After The Incal for him, which morphed into Final Incal.